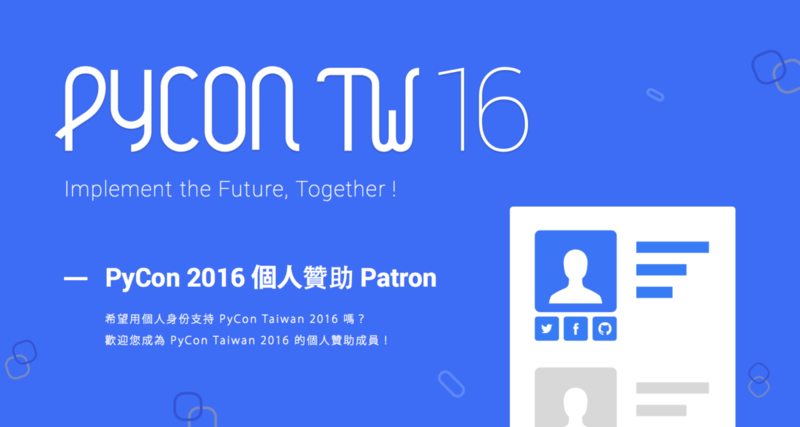 If you wish to support PyCon Taiwan 2016 on your own, this page is for you! There will be a page for the list of all patrons (e.g. links to profile pages of Facebook, GitHub, Twitter) on the PyCon Taiwan 2016 website. If you are a citizen of Taiwan (Republic of China), you can ask for a donation receipt for your income tax deduction. The patron packge DOES NOT include a ticket to PyCon Taiwan 2016. Get 1 free commemorative t-shirt. KKTIX issue refunds on behalf of PyCon Taiwan 2016. Should you need a refund, please note that you would only get back 90% of your donation since 10% of the ticket face value will be charged by KKTIX as service fee.